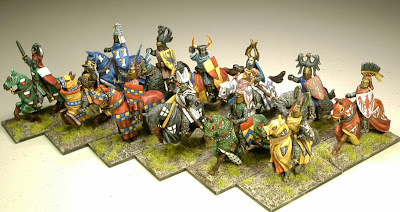 These are Old Glory figures from their Crusaders and Saracen range - actually listed as Turcopoles. I'm including them in an Early-HRE Clerical army as Szekler light cavalry. I'm not exactly sure what Szekler cavalry are supposed to look like, but they are listed (in the Armies of Chivalry supplement) as having light armor, bow, lance and shield. Quite a combination - which along with being Expert Horsemen with Feigned Flight and Parthian Shot abilities - should make for a formidable skirmish unit. 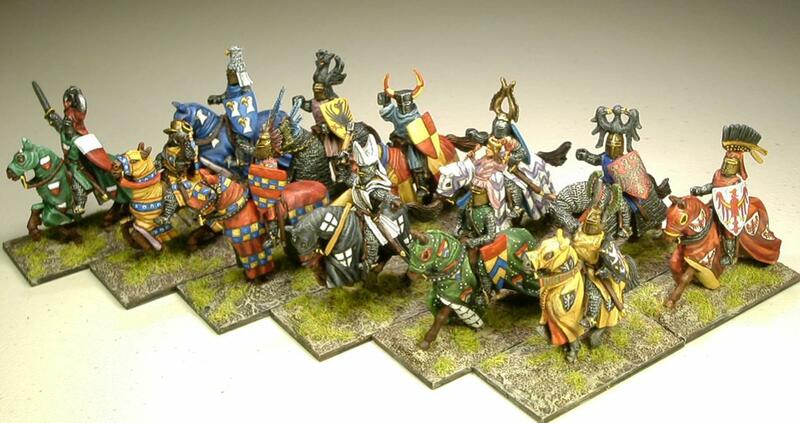 I experimented using Miniwax stain for the horses - thinking this would be a quick way of shading them. It looked okay, except for the fact the stain seems to remain sticky - I ended up coating it with clear matte spray. Then I dry-brushed the highlights of the horses. Don't plan on doing this again - too messy. Next up are the remaining infantry - Curteys spearmen and Old Glory crossbowmen. I also built movement trays for the knights and infantry. These will join previously completed Old Glory spearmen and crossbowmen to form three Mixed Order units of infantry. Then all I'll need to finish is the carrocio/army standard. As my oldest boy was taking out the garbage this morning, he came back in with a Fed Ex package. I had won a replica Sugarloaf Great Helm off of ebay earlier in the week. Didn't even expect it in till sometime during the new year. It was listed for about $45 and included the option to place an offer. I offered $39 - which included free shipping (from California). I was surprised to get back the approved bid within minutes - I wondered if I should've went even lower with my bid - oh well. Anyway, I had to open the package and try it on. A perfect fit! Okay, this is a posed shot; but the Gripping Beast figure has a Sugarloaf Great Helm on too! In between being a Christmas Eve couch potato, I managed to cut up some Wargames Accessories metal stands in 20X20mm bases, and also snip up some brass rod for spears. I also hammered the points of the rods into spear tips. Both of these items are for the Curteys spearmen and Old Glory crossbowmen for the Early-HRE army. Again, Happy Holidays and hope everyone is doing well. Have arrived; 24 spearmen, to include command, and 8 bowmen. The spearmen will be in a mixed unit with some Old Glory crossbowmen. They compare very well in both size and sculpting style. Here is a comparison shot with the unpainted Curteys spearmen with previously painted Old Glory spearmen from their Mongols in Europe range. The Curteys come with spears and various sized/shaped shields. I'm debating if I should replace the spears with wire rods like the Old Glory guys. This next shot shows the Curteys bowmen with Old Glory Crossbowmen from the Hussite range. The bowmen will be a separate group of skirmishers. I probably could've used some Crusader Norman archers I already have, but thought I'd have bowmen in the mixed spearmen unit. This changed after I placed the order when my buddy Scott offered up the Hussite crossbowmen to me. By the way, I just got an email update from Curteys today; they're going to raise their prices a bit come the new year. Got in a nice Chariot Wars game today with my buddy Scott A. at The Game Matrix. I broke my Mycenaean army down into two fairly equal armies. 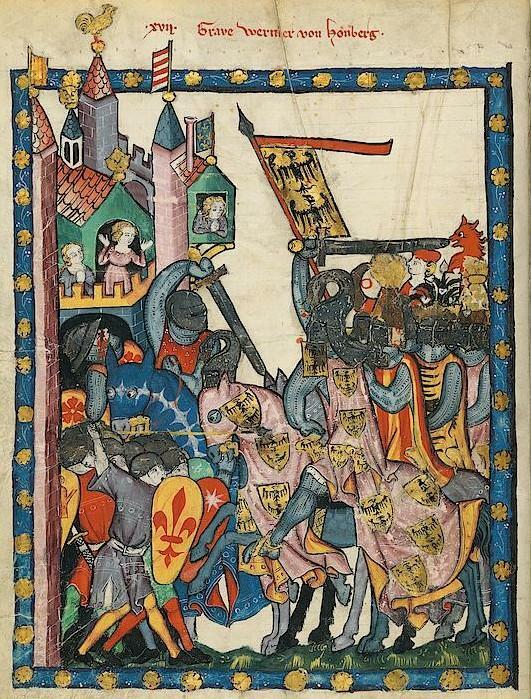 One had more troops armed with javelins; the other more troops with thrusting spears - including a chariot squadron. This was done to see how the two types compared in battle. Here are the opposing armies - some skirmishers are further out on the flanks. Here are a few shots of the game; however, as I played one side, I failed to capture all of the action. Also, apologies for the blurred and not so in-focus images. Seeing how we used the older version of WAB (1.5) - as well as not having played Chariot Wars in a long time, we probably did some goofy things. Suffice to say, it is good to be armed with missile weapons in chariots (two shots per); particularly if you are a hero with re-rolls for hits and wounds! Another item that came up was how to randomize missile fire on chariot squadrons with runners attached. It's probably in the 2nd Ed. rules, but since we only had 1.5, we ended up rolling 1-3 for hits on chariots & 4-6 on runners - then worked out wounds from there. Oh, and I have to add that more often than not, I kept forgetting to use the archers in the thrusting spear infantry unit. ADDENDUM: As this is a Chariot Wars posting, I'd be remiss if I didn't include better images of the actual chariots. They were played, but as the action got confused in whirling dust clouds and screams of horses, I failed to capture good photos during the game. So, here are some staged photos of the chariots - now one big happy equeta gang again. I could use one more chariot (already have Dendra armored crew) to have two, eight-chariot squadrons; or four, four-chariot squadrons for smaller games. Completed, except for adding their lances - which should be arriving soon - I ordered some 100mm spears from North Star. I needed some pikes for the Foundry Silver Shields anyway. I'll end up cutting down a few for lances. I decided on Siegfried of Westerburg, Archbishop of Cologne, to be the army general. Although on the losing side at the Battle of Worringen, he had an aggressive nature and not afraid to stir things up. Prior to taking the office of Archbishop of Cologne, he was the church official who oversaw the Teutonic Order in Germany. Coincidentally (or not? ), the coat of arms for the Archbishopric of Cologne is the same style black cross as the Teutonic Order. They are a mixture of Mirliton, Old Glory and Gripping Beast. The shields with animal charges are paper designs from Mirliton. I plan to start on the light cavalry next - they are Old Glory Turcopole figures - they'll be Szeklers with lance, bow and shield. Also waiting on an order of spearmen from Curteys. My buddy, Scott A. gave me some Old Glory crossbowmen who'll join the Curteys spearmen in mixed order. These are in addition to earlier completed Old Glory spearmen and crossbowmen. Finally, an Old Glory Hussite war wagon will be modified to be the Army Standard wagon. 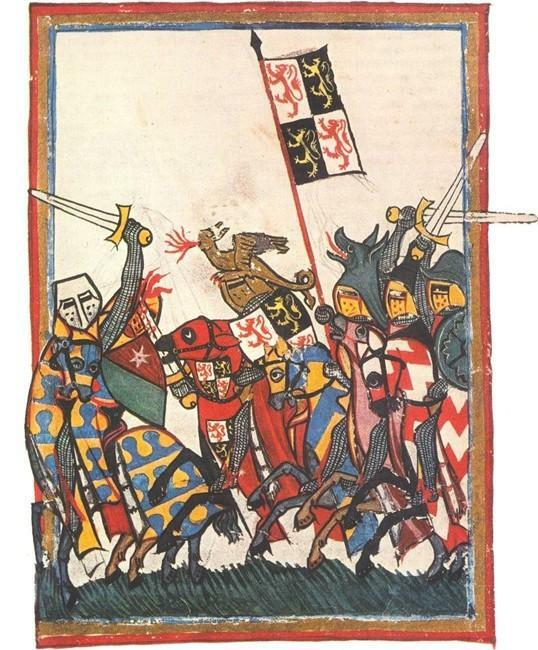 Here are some illustrations from the Codex Manesse of actual battles - as opposed to those of tournaments. 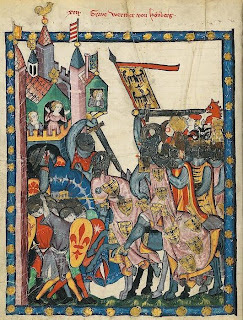 The first one depicts John of Brabant dealing a deadly blow at the Battle of Worringen. The figure in the center is a Mirliton model of Hartmann von Aue; the two on either side are Old Glory models with Mirliton helms. The helm on the left-hand figure is based on a helm belonging to Albert von Prankh of Styria. The figure on the far right is painted as Walter von Klingen. The shields have paper designs from Mirliton. The bases still need flocking, of course. I hand-painted the barding - including those crazy-looking chicken heads. Here is a picture of the Prankh helm preserved in a museum. It has a reinforced face plate, and was likely used for jousting. So I finally got off my duff and picked up a paint brush. Managed to finish the Walther von Metze figure. He'll be my other character for the early-HRE clerical army. I have an Old Glory guy with a mitre on top of his helm - he'll be the actual general. Anyway, I really like Metze's flamboyant wings on his helm. It reminds me of the helmet worn by Hagen von Tronje in Fritz Lang's Die Niebelungen. Of course the base still needs flocking, but I'll wait until I finish the rest of the knights - mainly the barding for their horses. Here is a shot of this figure (along with the rest of the knights WIP) - showing how the lines for the checkered patterned was sketched. Note that the shine on the figures is a coat of Krylon gloss to protect the barding while the pattern is worked. Also, the knights themselves will receive some Vallejo matte on the appropriate parts. I like my metal armor shiny. Here are the rest of the horses needing detail to their barding, along with another figure that I finished earlier. As his mount has mail barding it was a lot quicker to paint. Also, the shield is a paper design from Mirliton. 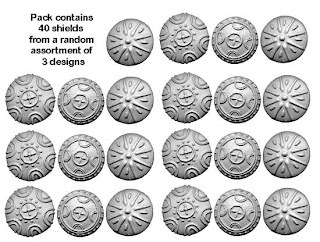 Just picked up the pack of Crusader Macedonian Shields which John up at The Panzer Depot was kind enough to add to his recent Old Glory order. Thanks to a tip from Allen Curtis on removing Foundry "bottle cap" shields he posted on Jeff Jonas' site, I took out my own trusty saw and started cutting off the "caps." 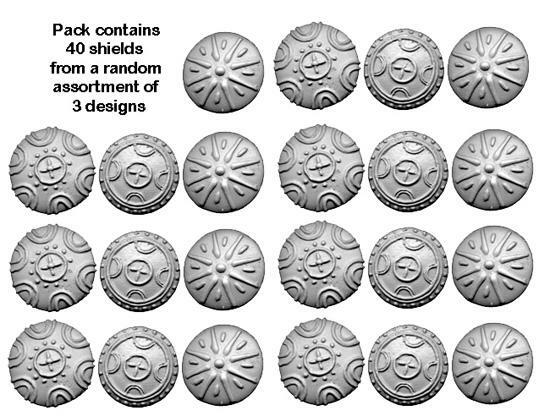 The photo below shows the figure on the far left with the original cast-on shield; next a figure with the shield removed; and the last three with different variations of Crusader Macedonian shields attached. Note lopped off shields at the foot of the second figure from the left. Although much thinner than the Foundry shields, the Crusader ones are slightly larger in diameter - which IMO seems to make them even more intimidating. I will probably get some Gripping Beast figures to beef up this phalanx unit to 28 figures - like the other three phalanx units already in the army. Speaking of needing more figures, after pointing up the Early-HRE WAB army in-the-making, it seems I will need approximately 38-40 more spearmen to make up the infantry percentages of a 2,000 point army. Another tip, this time from a fellow gamer here, Scott A. (who incidentally is also working on an HRE WAB army), I plan to order some Curteys figures. They look really nice, and the price is good - hopefully the shipping will be too.